SIZE: These sunglasses are medium size and measure about 5 1/2" across, lens height is 1 3/4", temple length is about 5". x and adjust for a custom fit. Lenses are made from shatter resistant polycarbonate(not acrylic! ), ear and nose pieces are made from integrated rubber, which keeps glasses from sliding. Magnifying part is useful when you need to track GPS, use phone, ect. We carry +1.50, +2.00, +2.50, +3.00 powers in all lens colors. There are several lenses to choose from. Smoke: Provides protection from glare and high levels of visible light and ultraviolet radiation without distorting color perception. Yellow: Reduces 'halo effect' around lights when riding at night, also increases contrast and sharpens vision. 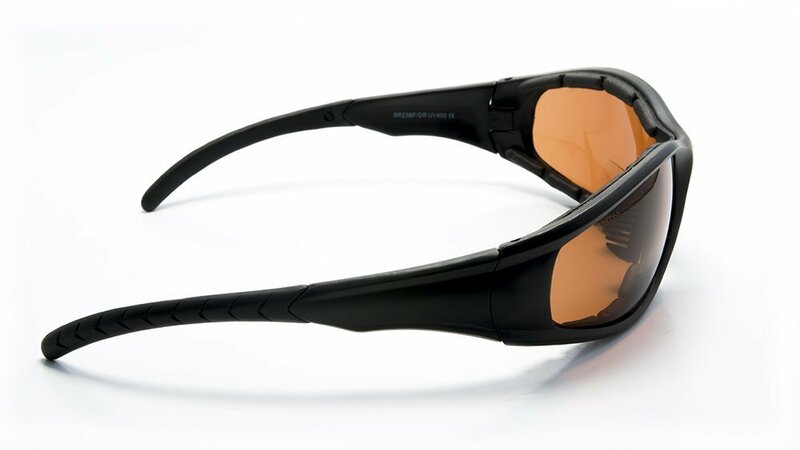 Copper: The copper lenses do well enough in bright sunlight and are much better in the varying light levels as you bike in and out of shadows. They also provide more contrast on cloudy days, and can help better read the terrain (i.e. pot holes, rocks, mud, etc.). Nice to use when mountain biking. Clear: Can be used at night to shield wind and debris without compromising vision. 100% UV protection is included in all our sunglasses, even in the clear lenses. Also they all are ANSI Z87.1 certified . These sunglasses are medium size and measure about 5 1/2" across, lens height is 1 3/4", temple length is about 5". NOTE: FLORIDA GLASSES® products are accompanied by a branded microfiber dust cloth bag designed to protect your Florida Glasses® eyewear. Click the button below to add the Bifocal Motorcycle Reading Sunglasses Googles for Men & Women to your wish list.